This may just look like a clump of something, with another clump of something on top- but Do Not let the image fool you! 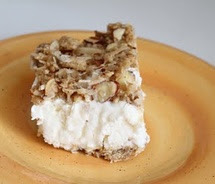 It is my mother-in-law's recipe for Ice Cream Pie, and it is a family favorite that is now spreading throughout my own extended family...It is easy & once you have had it once, you'll want it every time you think of it- I have a problem when it comes to birthdays in my house because my mother-in-law will make 2 pans of this and we typically always have some left over((meaning me eating it for breakfast, snack & dessert ... everyday till it's gone.)) And with the holidays around the corner, well let's just say she usually has one prepared in the freezer, in case we run low on desserts...?! In the pan, press ice cream down into an even layer. In a separate large mixing bowl, crush and crumble together the remaining ingredients and then layer the mixture onto the ice cream and press. Freeze till ready to serve, take out to slightly soften before serving so it is easier to cut.